Russian scientists are seeking to unlock the secrets of 3,500 year old Bronze Age graves where couples are buried together in a seemingly loving embrace. A Georgian kick-boxing coach breaks a Guinness World record that he himself created in December 2011, for having the most spoons stuck on the human body. A nine-year-old boy from the United States has become the youngest person to reach the summit of Aconcagua, the highest mountain in the Americas. 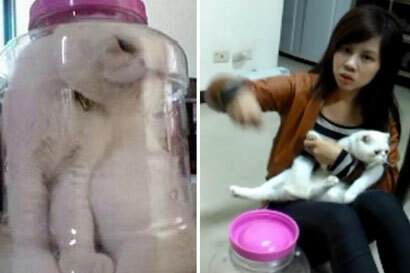 A university student has been charged with animal abuse after "punishing" her cat by stuffing the poor creature in a jar and then posting a picture of it on Facebook. Chinese smugglers have dug a "professional" concrete tunnel into Hong Kong equipped with lights, vents, steel reinforcements and even rails to transport goods, Chinese media reported recently. China's top legislature has formally adopted a resolution easing the country's one-child policy, the state news agency Xinhua reports. More than 70 people were injured, including seven children, as Roland Hughes reports. Global colour authority Pantone has chosen a tone of purple as colour of the year for 2014. Russia said on Thursday former Palestinian leader Yasser Arafat died of natural causes, not radiation poisoning, but a Palestinian official called the finding "politicized" and said an investigation would continue. In an echo of Jurassic Park, experts believe identifying and altering certain genes found in the DNA of modern birds would mean genomes of the prehistoric creatures could be engineered 20 million years after they died out.